American Girls in Moscow: Natalia's First "Big Girl" Bike! Here's Natalia's first time on her bike. The videos look odd because I filmed them on my phone—with a narrow rectangular format. And then Natalia taught her big sister how to ride a bike, too! I know I already wrote about this on Facebook, but other readers might not know about why it's not so odd that my kids are only learning how to ride bikes when they're almost eleven and 8 1/2. In studying Third Culture Kids (kids who are raised in a culture/country other than that of their parents), researchers found a few similarities among TCKS, irregardless of where they had grown up. Surprisingly, one of those is learning how to ride a bike much later than peers in their non-TCK home countries. (Other similarities include not knowing how to drive until after college and not knowing quite how to answer the question "Where are you from?"). It makes sense if you think about it... Unless the kids are growing up in a country where kids easily ride bikes for most of the year, and it's easy to store them, kids aren't that likely to ride a bike where they live during the school year. Then, during the summer—when most kids ride bikes all the time during their vacations—Expat kids tend to travel from relative to relative in order to see everyone. 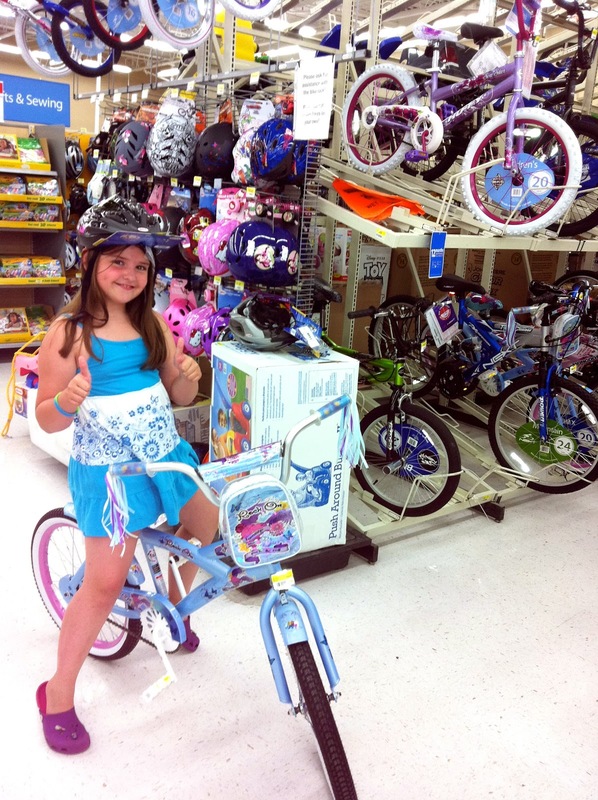 You're just not likely to buy a kid a bike that she can only ride for a few weeks at most! We're so cramped in our Moscow apartment, and we have no storage at all. Our balcony isn't covered, either. The only time the kids could ride a bike in Moscow would be on weekends in September, the second half of April and May—and then during June. I would need a bike to keep up with them in order for them to really use them, too... Where would we put those bikes? We've decided to go ahead and get bikes back in Moscow, though... We'll keep them very well oiled and covered in heavy plastic on the balcony. It's going to be a real pain to get them in and out of the apartment, but the girls really love it! At least Katya won't be growing that much anymore, so a bike will last her a long time. Not sure if this applies, but they do make collapsible (folding) bikes. Perhaps not for the girls, but for the adults. Also, it's of interest for me to hear that girls are speaking to each other in English.. Do they always or do they switch to Russian? From my experience as an immigrant to US, me any my sister switched to speaking English between ourselves quite early on, within a few years of being here. I was 13 we came here and my sister was just 4. We both picked up English at about the same speed, and have since been speaking English to each other, even though we speak to our parents in Russian (well, my sister speaks English with them too now).. Yes, Sara, she IS thrilled... Utterly!!!! Perhaps even more because she learned to ride before her *older* sister...! Sofia--English has always been the girls' native tongue. We speak in English at home unless a non-English speaker is with us. 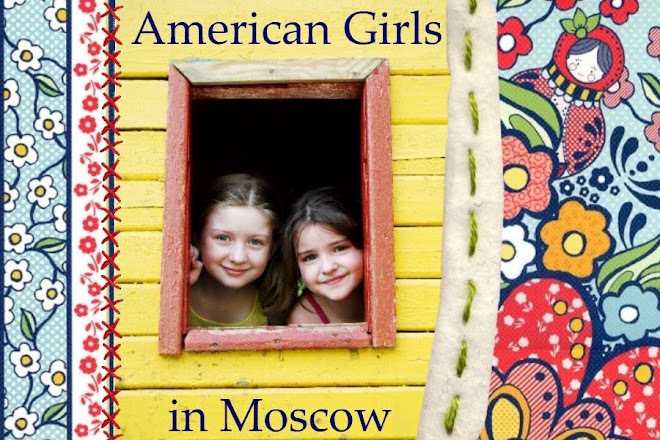 They do speak Russian between themselves--but only when they want a "secret" language among others who don't know Russian, or if they're just goofing off. This summer I'm encouraging Natalia to speak it more, though, because I really don't want her starting the school year at a deficit. (Katya's Russian is stronger). That's what I was wondering about - for me and my sister, we switched to our new language within a few years, eventhough at home everyone kept speaking our native language. Good job for keeping their native language truly their 'speaking' language. My sister almost does not speak her 'native' language anymore, only understands when spoken to. The girls look like they are having fun. My 8 1/2 year old (adopted from Moscow at age 3) is still riding his bike with training wheels. It is one of my goals this summer to have him riding without the training wheels. I had him going down the driveway (on a hill) learning how to use his brakes properly today. He is scared to go fast. I can walk faster at times. My parents hopefully bought me a bike when I was 7. I learned to ride it when I was 9. I just never liked bike riding.... Still don't, but I took to roller skates! And I'm tempted to skate now, except my children would be mortified. Way to go Nataliya and Katya!! I also didn't learn to ride a bike until I was about 7yrs old - but I think I was just a late bloomer. Now I love to ride my bike all the time! The look on Natalia's face in the second photo is priceless! 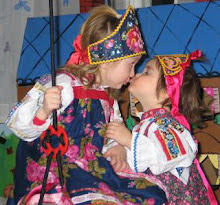 Simple pleasures for both Natalia and Katya- don't you love it?